Commercial property/casualty insurance underwriting today is a complicated, often messy process. By asking fewer underwriting questions and instead presenting multiple quotes reflecting potential differences in risk profile, commercial carriers can improve experiences of customers and agents. But carriers also care about improving their loss and expense ratios with accurate pricing. Here, a DataCubes VP addresses both sides of the coin on the road to optimizing commercial underwriting processes. Many times the agent sends new business applications, loss runs and other documents (together known as submissions) to the insurer through email in a variety of structured and unstructured formats. There is often a great deal of Q&A between the prospect, agent and underwriters to ensure the completeness of this information. Despite these efforts, submission information may still be of poor quality, inaccurate and unverified. It then has to be manually keyed into the insurer’s system, which introduces additional quality challenges. From there, an average of 30 manual web searches are typically required to gain the additional insight necessary for quoting, according to DataCubes proprietary data. Commercial underwriting for new business is expensive, complicated and can take days or weeks to complete. Fortunately, current trends in InsurTech have fueled significant improvements in the commercial underwriting process with the promise of reducing loss and expense ratios while improving the customer experience. Efforts to optimize commercial underwriting processes are being pursued in some form by nearly the entire industry. They take many shapes and carry with them the promise of meeting the digital expectations of a modern world by reducing much of the time and energy previously required to produce a quote. Heads: Answering underwriting questions more efficiently and accurately to provide a better quote. Tails: Asking fewer underwriting questions to make it less onerous for prospects to obtain a quote. In theory, addressing both sides of the coin at the same time is the fastest path to success. However, this requires prioritizing multiple threads of focus and execution within an insurer’s organization. While conceptually possible, practically these projects are likely to compete for the same internal resources and also cause a degree of organizational fatigue that can slow meaningful change. Addressing one side of the coin at a time is more realistic and is the path taken by many insurers. This is a great approach to start delivering results quickly, which is a key factor in the success of both insurance organizations and executive careers. Addressing neither side of the coin is a challenging path in the long term, threatening to leave those who fail to evolve lightyears behind in their capabilities. There is simply no contest in traditional underwriting methods compared to modern ones driven by extensive third-party data and advanced technologies such as artificial intelligence. Intelligently automating the intake of submission documents (e.g., ACORD and other application forms, loss runs, statement of value worksheets, etc.) for applicable types of business on middle-market and large commercial accounts. This can replace up to 95 percent of the manual labor required for this function all while increasing submission accuracy. Enriching submissions using third-party data. This empowers underwriters by providing new insights on a business’s activities, as well as surfacing cases where submission data may be incorrect. Using machine learning to answer as many underwriting questions as possible. Training algorithms to think like underwriters when answering underwriting questions leads to powerful, consistent decision-making based on all the data available on a risk, and it can be done in near-real time. Leveraging analytics to help insurers select and prioritize the right submissions to quote. The aforementioned efficiency and accuracy plays will contribute significantly to improving an insurer’s loss and expense ratios while also providing truly game-changing customer experiences. For example, one DataCubes customer was able to reduce the number of underwriting questions asked on a General Contractors BOP submission by nearly 75 percent by implementing several of the concepts above. The flipside of the commercial underwriting optimization coin is asking fewer underwriting questions. While underwriting questions are meant to ensure adequate knowledge about the risk, in reality many are answered without much thought. This is done for a variety of reasons, including convenience, habit and avoiding the rejection of the submission. For example, on most supplemental applications for restaurants, the insured is asked if the cooking system is UL 300/NFPA compliant. In many cases, this is simply answered “yes,” regardless of the truth. The point of the question is to ensure there is documentation showing it was asked and the insured answered affirmatively. If there is a loss where the cooking system is later not found to be UL 300/NFPA compliant, any resulting claim may potentially be declined. This same function can be achieved by packaging different quotes automatically based on the type, location and nature of the business in question. Each quote option would include and display assumptions such as the existence (or lack) of a UL 300/NFPA-compliant cooking system. In other words, the potential insured or agent would see two quotes: one for a business with a compliant system and one without. This enables the same disclosure up front, without the hassle of asking an important but often disregarded underwriting question. It all comes down to presentation. An insurer can either present the agent or insured with a full list of underwriting questions, or it can include the assumed answers for some types of questions based on the business characteristics when a quote is provided. To achieve optimization in such instances, an insurer needs to evaluate each question for each line of business, class, geographic area and possibly other categories to determine the best way to present the information. While well worth the effort in the long run, this process requires careful thought and a significant amount of time and energy. Once an insurer has arrived at the minimum number of underwriting questions required to maintain sufficient transparency and management of the risk, the next step is to determine how many of those questions may be answered using only third-party data. For many classes of business, insurers can merge commercial insurance underwriting and marketing efforts, enabling firm offers for insurance without an application. See “Why Application-Less Placements Make Sense for Commercial Insurance” to learn more about AXA XL’s recent work in this area. This is the future. 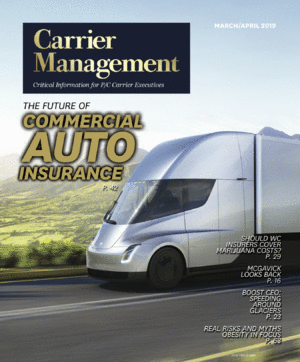 Leading national carriers, regionals and MGAs are all pursuing a commercial underwriting transformation in some form. Insurers that are winning in this area are doing so by following some basic guidelines for success. Balance speed to market with speed to value.The easiest point of execution is often the best, but do not lose sight of the impact. Per SNL data, pure losses are on average 57 percent of commercial insurance premium charges, while salaries are a mere 9 percent. Therefore, initiatives that improve the loss ratio can potentially make a substantially larger impact to overall profitability. Unfortunately, loss ratio benefits also take a long time to prove out. For this reason, insurers need to balance their ability to move initiatives to market quickly with their ability to show value along the way. Leverage analyst, researcher and vendor insights to procure the best information possible for their business case. Ensure the benefits tie directly to the largest pain points of their organization. Define a clear plan of execution with flexibility built in. Execute, execute, execute. This is the most crucial element. Once an insurer is committed, it’s time to grind. Insurance is not for the faint of heart, and transforming the industry requires grueling hard work, which entails obsessive dedication, proactivity and the raw willpower to succeed. It is imperative that insurers have the right team and culture to demonstrate these virtues when needed. Monitor and control. Not everything goes to plan. Insurers should expect this truth, mitigate project risks and be honest about their results. Delivering a 30 percent efficiency gain that is real and easy to measure is far superior to claiming an 80 percent gain laden with caveats. The quest is achievable and, in order to prosper, both sides of the commercial underwriting optimization coin eventually need to be addressed. Insurers that do not pursue either side of the coin will have to find another way to compete in order to survive, because it will not be on speed, accuracy or customer experience. Those that implement change, particularly by addressing one side of the coin at a time, will find success more easily and enjoy the benefits of their investment for many decades to come. Phil Alampi is Vice President of Marketing for DataCubes, responsible for bringing DataCubes underwriting technology innovations to market. He is also a frequent public speaker and plays a key role in business and product development. Previously, Alampi was Senior Director of Marketing at LexisNexis Risk Solutions, responsible for all marketing in the U.S. for its Insurance division. Connect with him on LinkedIn at www.linkedin.com/in/philalampi/.